Philip Weedon enlisted in his home province of Saskatchewan on March 11th of 1941. Leaving Paddockwood Saskatchewan for training at the usual precursor postings before completing his ITS training at No. 2 ITS ( Regina) on January 28th of 1941, followed by No. 15 EFTS (Regina). On completion of EFTS training in November of that year he then was posted to No. 11 SFTS ( Yorkton Sask.) which he completed in February of 1942. P/O Weedon reported to 419 squadron on September 22nd 1942 from No.22 O.T.U. Searching through the squadron ORB it is not until on February 2nd of 1943 with a crew comprising of F/O P. Campbell, F/S Keon, Sgt. Wigelsworth, Sgt. Hooper, Sgt. Poole and F/S Goring, shows P/O Weedon being part of an 419 squadron operation. As a pilot of one the squadron’s new Halifax bombers they were on this occasion part of a Gardening operation in some very nasty weather at 800 feet, and still could not see the parachutes of the mines opening because of the heavy clouds. After being damaged during an attack at Dortmund on the night of May 23/24 1943, F/O Weedon managed to bring the aircraft back to base. Flak had damaged the wings and knocked a hole into the Halifax's fuel tank. To add to the crew's problems and stress was the fact that enemy fighters were in the area of the base so Halifax BB384 had to circle the base using up what little fuel they had left. Finally the fuel shortage caused two of the engines to cut out and a forced landing near Dinsdale resulted. All of the crew made it safely through the crash landing. It was later found out that it was not flak that had damaged the fuel tank. An incendiary dropped from another aircraft had broke through the Halifax's wing and damaged the fuel system. By the time he completed his service with the squadron he would hold the rank of Squadron Leader and be Flight Commander of "B" Flight. Gazetted on December 7th 1943 (as non-immediate) with the award finally presented 6th. November 1948. This officer has participated in many day and night attacks against some of the enemy's most heavily defended targets. He has flown with conspicuous gallantry and outstanding skill, setting a praiseworthy example of courage, determination and devotion to duty. On one occasion during an attack on Dortmund his aircraft was severely damaged by incendiaries and certain petrol lines were severed. Squadron Leader Weedon flew his aircraft back on three engines, making a successful crash landing without injury to his crew. The small town of Paddockwood was to have two of it's son in the service. Philip Weedon's brother James also served in the air force. 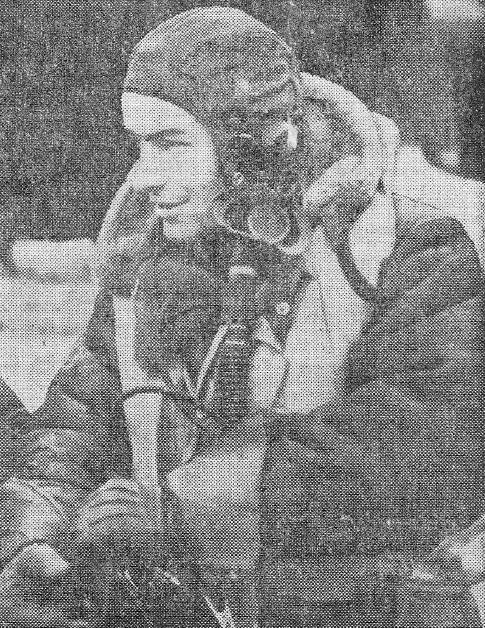 James Fredrick Gladson Weedon was posted to 426 squadron as WAG, he was killed while on an operation November 1, 1944,a night raid on Oberhausen.